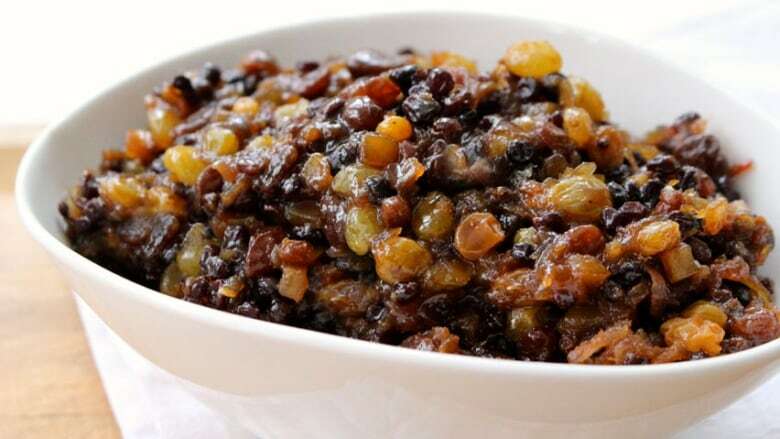 There are few foods as closely associated with the holidays as mincemeat. Generations past made it with copious amounts of beef suet, but these days all-fruit varieties are more common. 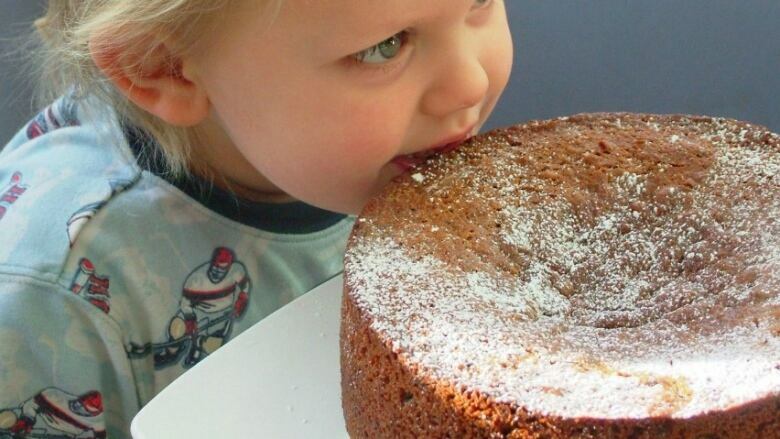 There are few foods as closely associated with the holidays as mincemeat. Generations past made it with copious amounts of beef suet (grated beef fat), but these days all-fruit varieties are more common. It’s simple to make, but once you have a batch — whether jarred or homemade — it has more potential than it’s often given credit for. If your mincemeat repertoire is limited to tarts — not that there’s anything wrong with that — below are a few new uses for that dark, delicious mash-up of dried fruit, apples, citrus and spices. And if you’re not in a baking mood, it’s also fantastic warmed and served over ice cream or swirled into a bowl of oatmeal. In a large saucepan, combine all the ingredients except the walnuts or pecans (if you're using them). Bring to a simmer and cook, stirring often, for 20-30 minutes, until dark golden and thick. Remove from the heat. 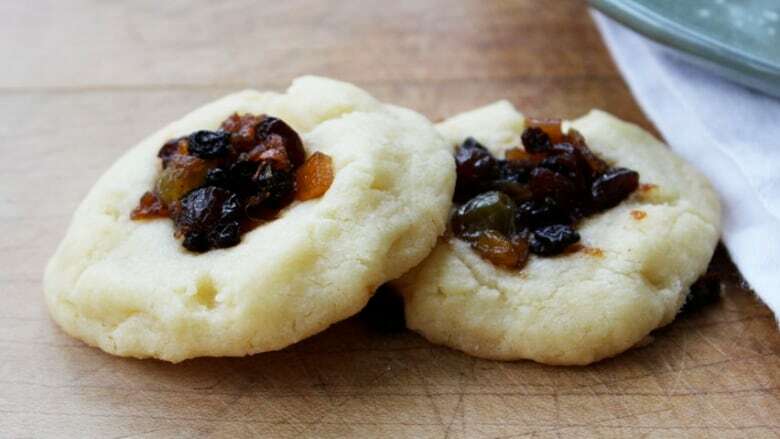 If you like boozy mincemeat, add about ¼ cup brandy or rum. Let cool and stir in the nuts, if you're using them. Store in a sealed container or jars in the fridge for up to two weeks, or freeze for six months. Makes about four cups. 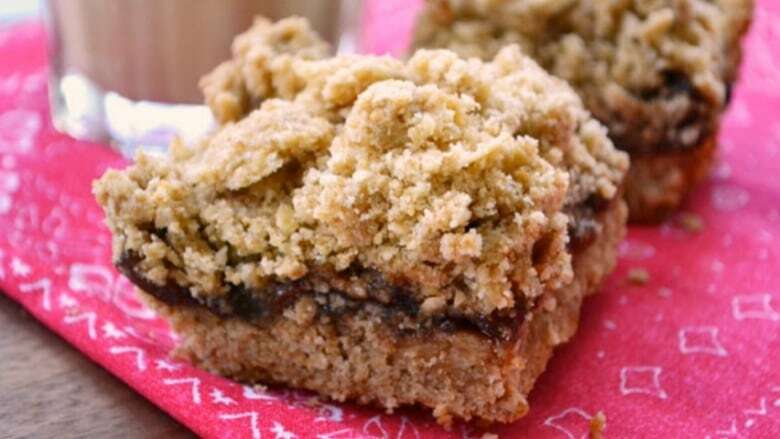 Swap the traditional date filling with mincemeat in any date square recipe. Served warm, the crumbly squares are delicious topped with a scoop of ice cream. Or serve them cold for eating like any other cookie or square. Preheat the oven to 350˚F. 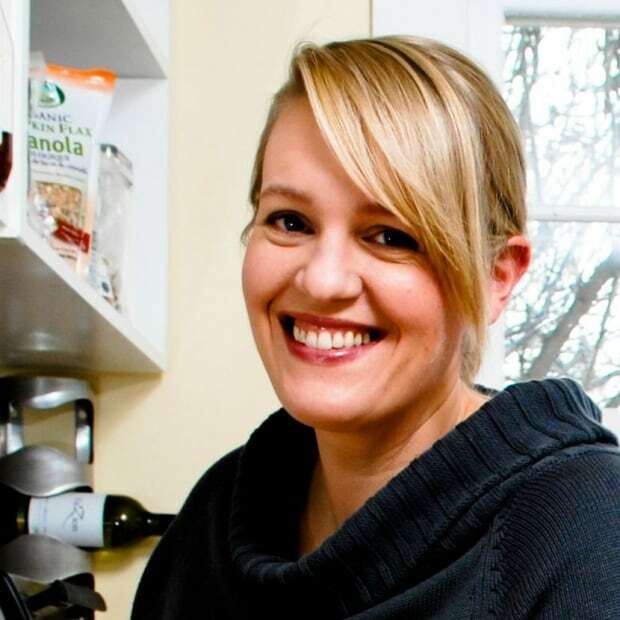 In a bowl or the bowl of a food processor, combine the oats, flour, brown sugar, baking soda and salt. Add the butter and pulse or mix until well blended and crumbly and then press half into the bottom of an 8″x8″ or 9″x9″ pan. Spread the mincemeat over the base, then scatter the remaining crumbs over top, squeezing them a bit as you go to create larger clumps. Bake for 35-40 minutes, or until golden around the edges. Cool completely before cutting. If you don’t have the gumption to make fruitcake, a mince cake is far easier and has similar flavours, with a finer, cakier texture. Adapted from Nigella Lawson’s Feast. Preheat the oven to 350°F. Line a high-sided 9-inch round baking pan with parchment and spray the whole thing with non-stick spray. Put the butter, brown sugar and lemon and orange zest into the bowl of a food processor and blitz it to blend and get rid of any lumps of brown sugar. Whiz in the eggs. Add the flour, baking powder and baking soda and pulse until almost combined. Add the mincemeat and pulse just until blended. Scrape into the pan and bake for 1.5 hours, until the cake is springy to the touch; if it’s darkening too quickly, lay a piece of tin foil overtop. Let cool completely on a wire rack. 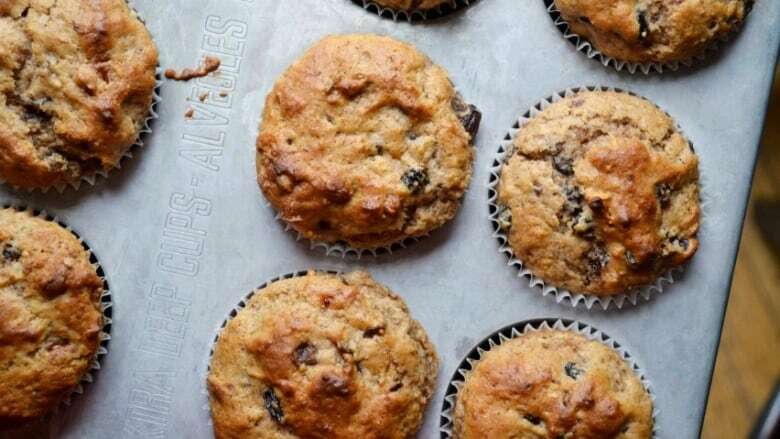 Preheat oven to 400°F and line 12 muffin cups with paper liners. In a largish bowl, stir together the flour, sugar, baking powder, cinnamon and salt. In a smaller bowl stir together the milk, oil and egg, and add it to the flour along with the mincemeat. Stir until the batter is almost combined, then add the apple and nuts and stir just until blended. Fill the muffin cups almost full and bake for 25 minutes, or until golden and springy to the touch. Serve warm. Makes a dozen muffins. Of course, festive tarts are the ultimate use of mincemeat; make them big or small, top with a cut-out piece of pastry (stars work well) for a festive presentation, and dust with icing sugar just before serving. In a large bowl or the bowl of a food processor, stir together the flour, sugar and salt. Add the butter and use a fork, pastry blender, wire whisk or the “pulse” motion of the food processor to blend the mixture until it resembles coarse meal, with lumps of fat no bigger than a pea. Drizzle the water over the mixture and stir until the dough comes together, adding a little more a bit at a time if you need it. Gather the dough into a ball, flatten it into a disc, wrap it in plastic and let rest 20-30 minutes. To bake the tarts, preheat the oven to 375˚F and roll the pastry out on a lightly-floured surface to about ¼-inch thick. Cut out circles with a cookie cutter or glass rim and press into ungreased muffin tins — regular or mini. Reroll the scraps once and cut out small rounds, stars or other shapes if you want your tarts lidded. 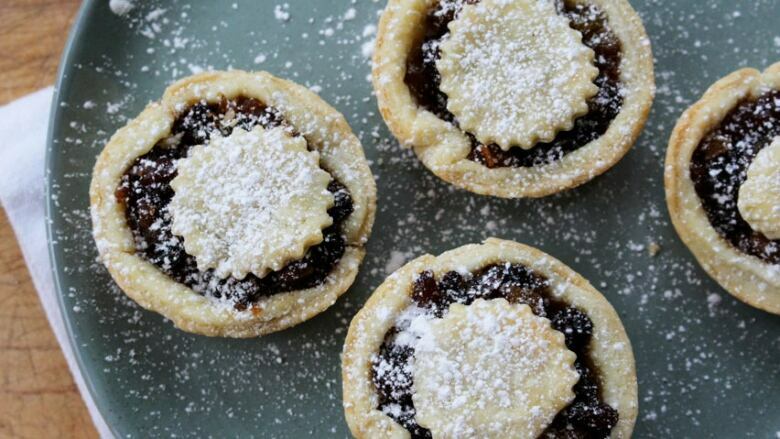 Fill each pastry cup with mincemeat and either leave open or lay a cut-out piece of pastry on top. If you like, brush with a little milk or cream and sprinkle with sugar. Bake for 15-20 minutes, until golden. Let cool until warm, then run a thin knife around the edge to remove them from the pan. Makes about a dozen tarts. Buttery shortbread are traditionally filled with jam, but mince is even more interesting — and Christmassy. Preheat the oven to 350˚F. In a large bowl, beat the butter and sugar for two to three minutes, until pale and light. Beat in the vanilla. Add the flour and salt and stir (or beat on low) just until you have a smooth dough. Roll into walnut-sized balls and place on an ungreased baking sheet. Make an indent in each ball with your thumb (don't worry if it cracks a bit — just press it back together with your fingers) and fill with about ½ tsp. mincemeat. Bake for 12 minutes, or until pale golden. Cool on a wire rack. Makes about two dozen cookies. 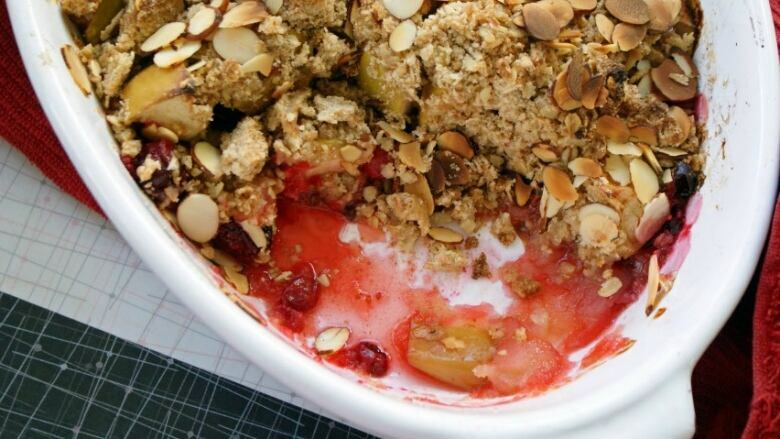 If the thought of baking a pie from scratch is intimidating, try a fruit crumble — it's all the best parts of a pie jumbled together in a baking dish and topped with a crumbly topping. You don’t have to worry about cutting a clean slice, and it’s just as delicious served warm with vanilla ice cream. To make the crumble topping, pulse the oats, brown sugar, flour and butter together in the bowl of a food processor, or blend it all with a fork or your fingers in a bowl until well-combined and crumbly. Preheat oven to 350°F. In a 9x13-inch (or similar sized) baking dish, toss the apples, cranberries, mincemeat, brown sugar and cinnamon together until well blended. Sprinkle with the crumble topping, squeezing it together with your fingers to make larger clumps. Bake for 45 minutes, or until bubbly around the edges and golden. Serve warm, with ice cream. Serves eight.